The ECSO is pleased to offer a ten-week free evening seminar to adults who are interested in the daily operations of the Sheriff’s Office. The goal is that participants, upon completion of the course, will attain a better understanding of what your sheriff’s office does and why, and experience improved communication and partnership between themselves and the ECSO. The Citizens Law Enforcement Academy (CLEA) meets on Thursday evenings for ten weeks. Our next class begins on July 11th from 5:00 PM* to 9:00 PM at the administration building located at 1700 West Leonard Street. *Complimentary meals are provided for attendees. Sign-up early to ensure your seat in this class before it fills-up. 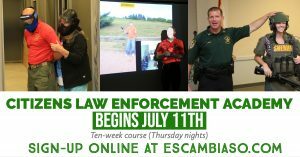 Go online to http://www.escambiaso.com/citizens-law-enforcement/ to register.